So let’s discuss my wash day routine. This process can be a very long and tiring one, as most naturals know, but it’s what I do to get rid of build up, moisturize, and prepare for the upcoming week. So from beginning to end, I’ll go over every step in my weekly routine. I like to begin by detangling my hair in sections. I spritz each section with water and then use grapeseed oil to finger comb through. This step helps make it easier to shampoo and it is also used as a pre-poo treatment. After that is complete, I move on to actually shampooing. The shampoo stage is completed while I’m showering for the night. 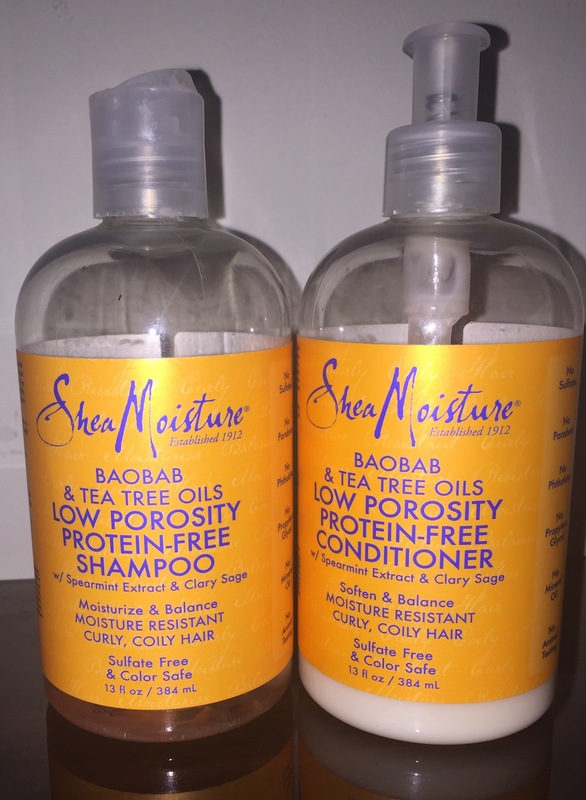 Currently, I am using Shea Moisture Low Porosity Baobab Tea Tree Oils Shampoo and Conditioner. Since learning that I have low porosity, I try to do my best to choose products that are geared more to my hair type. The shampoo really clarifies my hair removing the build up from the previous week and the conditioner moisturizes well without being so heavy. Once I’m done, I then follow up with a deep conditioning mask. 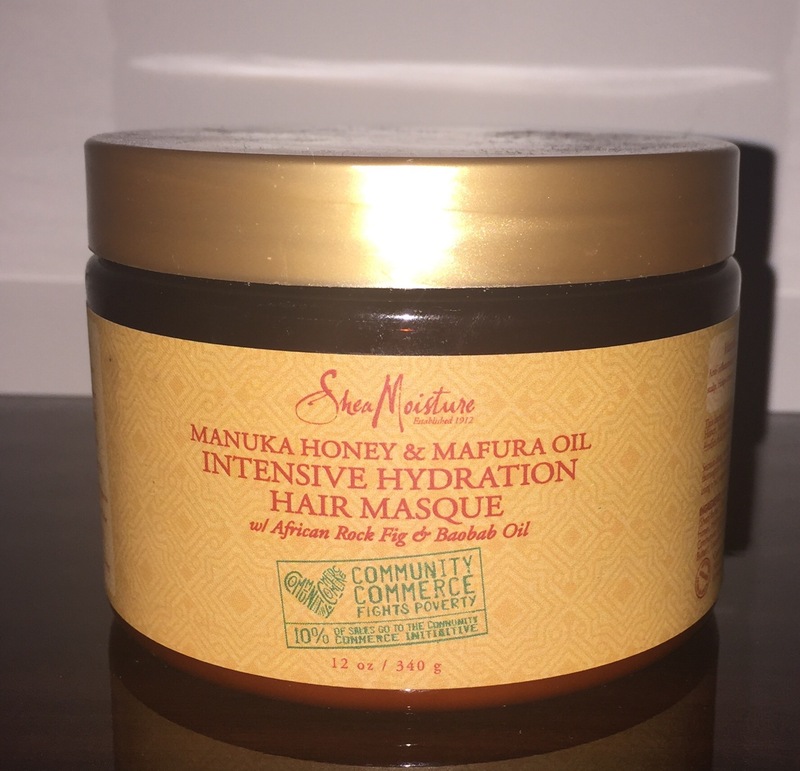 I’m still using the Manuka Honey & Mafura Oil Intensive Hydration Masque. It hasn’t let me down yet so if it ain’t broke, why fix it? I apply it by sections and then put on a plastic cap and leave on for about 10-30 minutes, depending on what my schedule looks like for the day. Afterwards, I rinse with warm water. After I towel dry my hair in a t-shirt, I then begin my apple cider vinegar rinse. I used an old product bottle and added one part water and two parts ACV. This step helps to soften my hair, reduces frizz, and I’ve noticed that it rinses any excess from my hair masque. I make sure that I thoroughly rinse this out because, you know, the smell. Now my final step is my LOC method. For those not familiar with the term, the LOC method involves a Leave in conditioner, Oil, and Cream. I use this method as a final conditioning method. 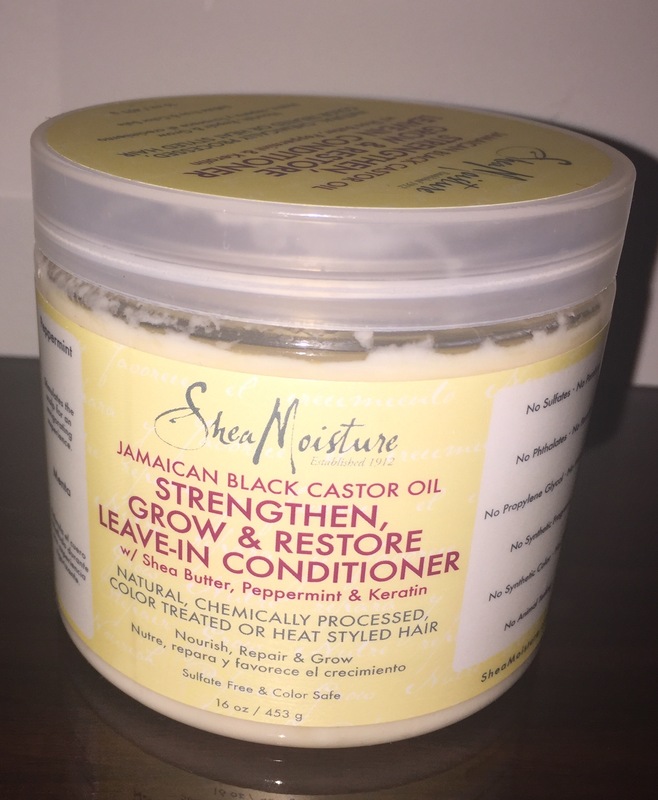 The items I use include the Baobab & Tea Tree Oils Low Porosity Protein-Free Leave in Conditioner from Shea Moisture, grapeseed oil, and Jamaican Black Castor Oil Leave in Conditioner, also from Shea Moisture. I just recently started using this and it has really left my hair soft without a heavy, oily feeling. Sometimes I may add a styling product as I do my LOC method section by section. After I finish my LOC method, I allow my hair to air dry and wrap it up in a silk scarf, pineapple style. My washday process may seem very lengthy, but since I’ve been doing it for some time, it doesn’t seem as long for me. However, writing about it has worn me out. So that’s all for now. See ya next time. Deuces!! Well hey there! Hope you are doing well. I’m doing just fine myself. 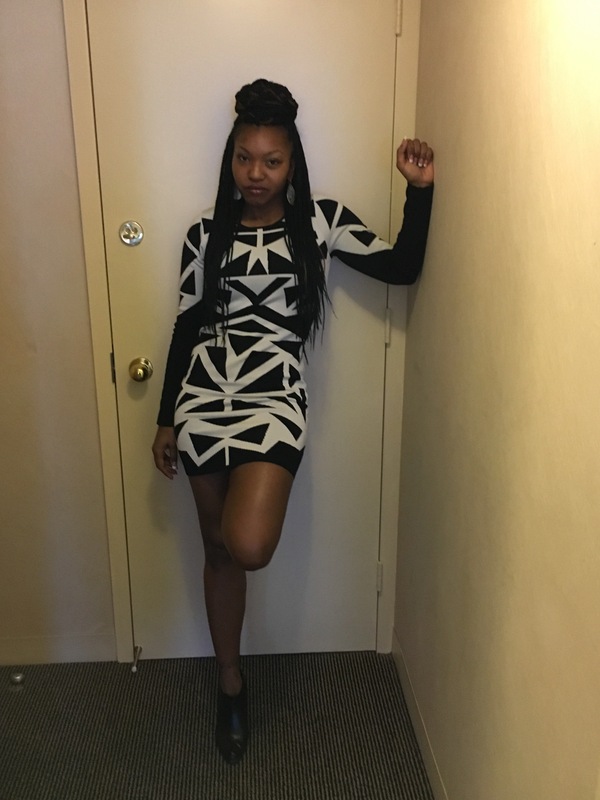 It’s been some time since we last spoke and I want to get back in the game, so why not do so with a great story that involves some great fashion. So this all began a few days ago when I received some exciting news via email. The music steaming service that I’m subscribed to, Tidal, informed me that I had won tickets to see Rihanna!! 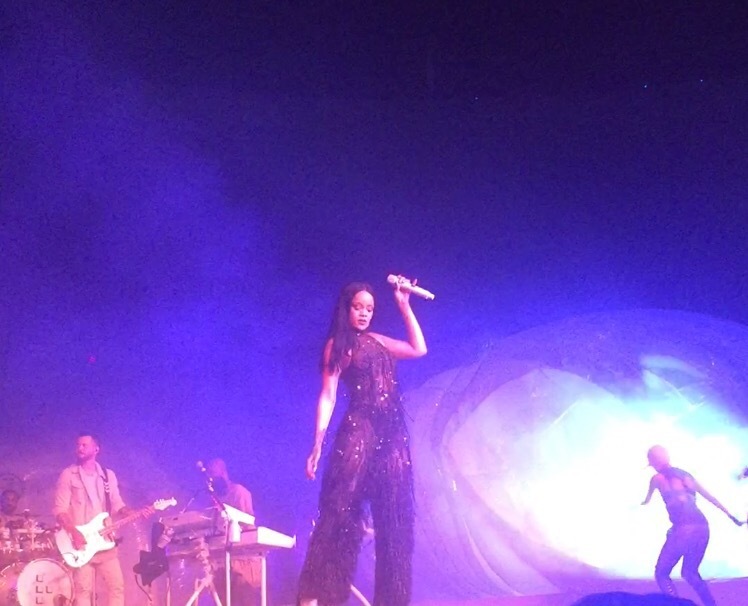 I had completely forgot that I had registered for her show in Cincinnati, so it took me by complete surprise. I made plans with my best friend and we just couldn’t wait until Saturday came. Now of course I immediately started thinking of what to wear but due to the excitement and some stress from work, I couldn’t think of anything. I had an idea but still couldn’t decide as I threw several pieces in my suitcase the day of the show. It wasn’t until we started getting ready at the hotel that I decided on this number. Not bad for last minute. 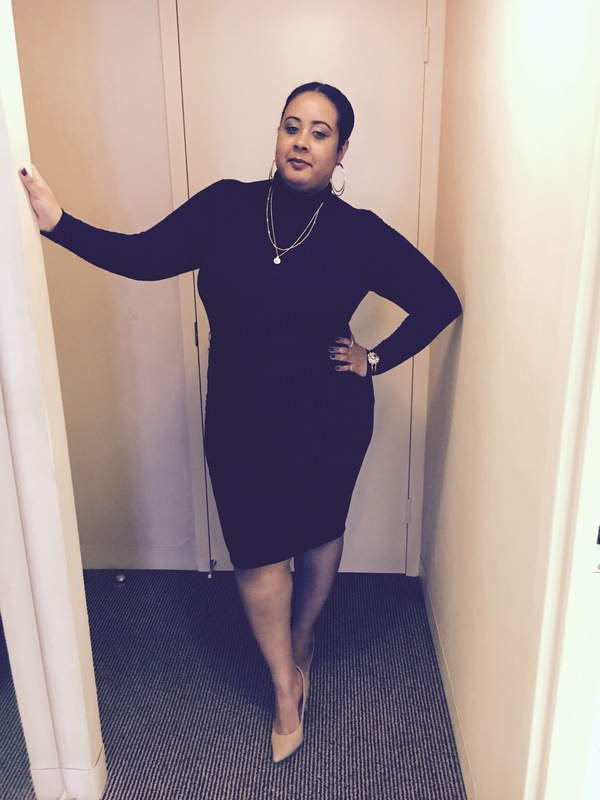 The ensemble consisted of a black turtleneck and black skirt that I’ve purchased from H&M before. I wanted something that didn’t require a lot of effort but still got the job done, and I think this outfit did just that. So now for the best part. We made it to the venue and our seats were great! However, during a pizza run, this wonderful, magnificent gentleman asked us where we were sitting and pulled out a stack of tickets. He hand us two front row tickets and we couldn’t believe it!! After several hundred thank you’s, we ran to our seats to grab our jackets and ran to our new seats. I couldn’t believe she was going to be right there, in front of us the whole time. 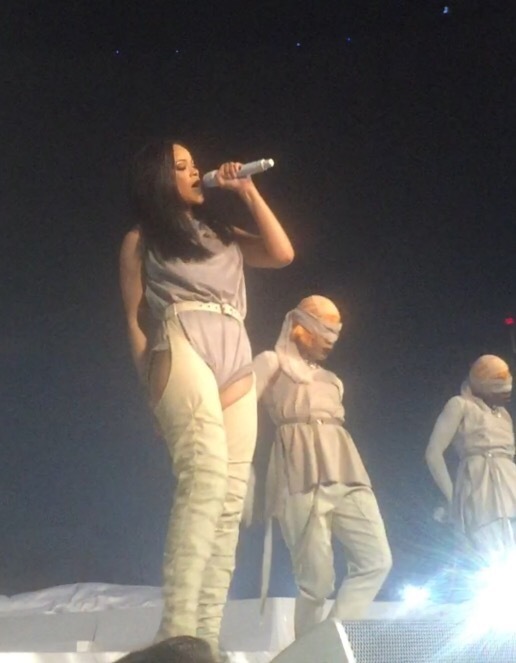 We were in perfect position to see all the fashion that Rihanna would provide and let me tell you, she did that!! It was great to see the details and craftsmanship that went into her costumes. It was a night that I, most certainly, won’t forget. Thank you for letting me share. I’ll see you guys next time. Deuces!! !